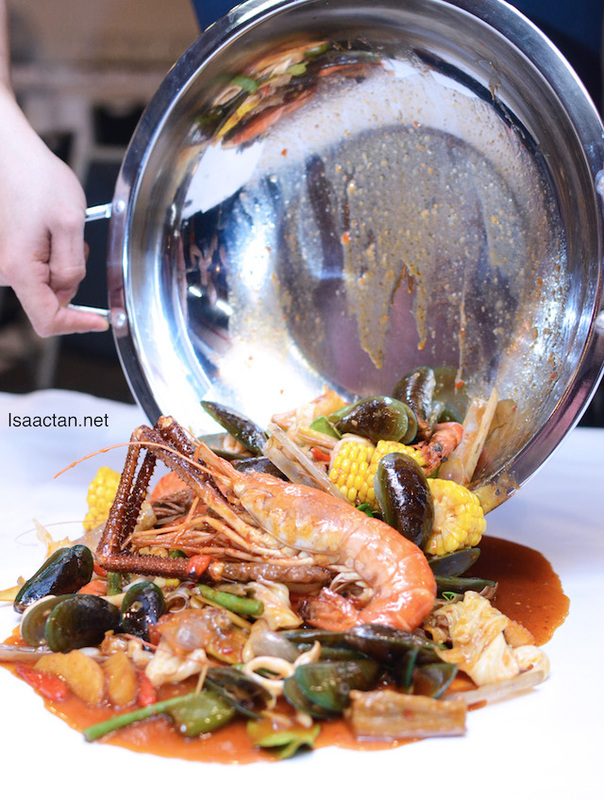 Those who are into seafood, will love the new offering from 33 Seafood Steamboat Restaurant @ Bandar Puteri Puchong. Famous in the vicinity, the restaurant recently revamped their menu with exciting seafood dishes, introducing new and exciting offerings. 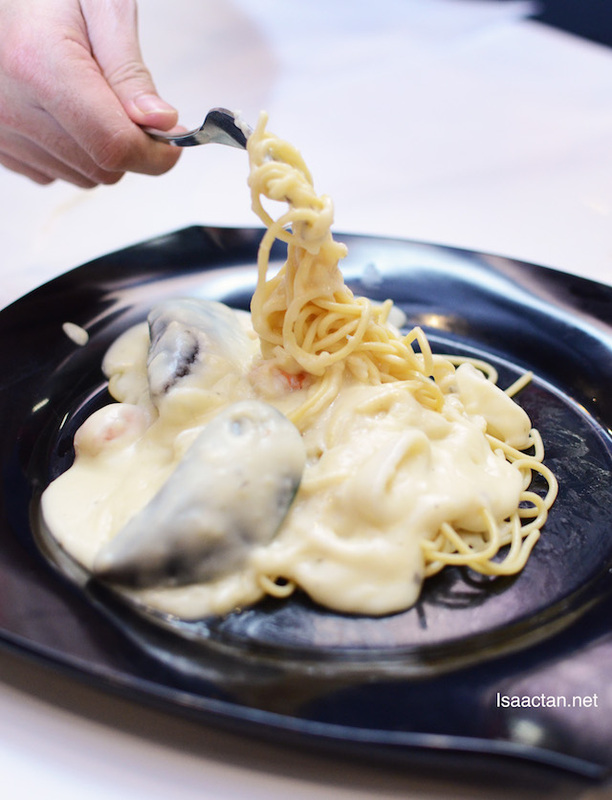 We had the opportunity to dine there recently, and it was a seafood fest! 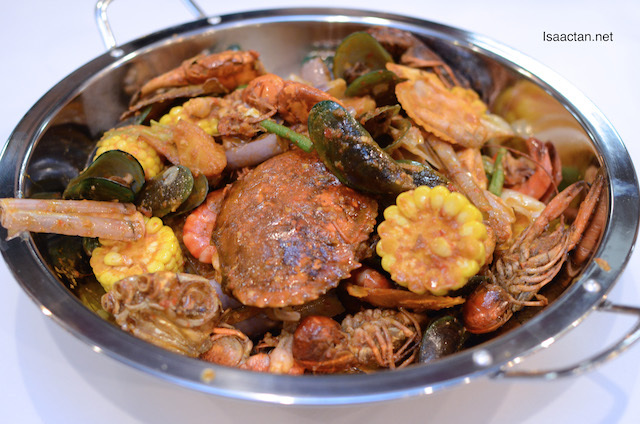 33 Seafood Steamboat Restaurant has been gaining a lot of attention recently for its nice seafood steamboat cuisine, but now with the introduction of its new yummylicious offerings, it's all geared to gain even more fans and customers. Check out what they have to offer below. 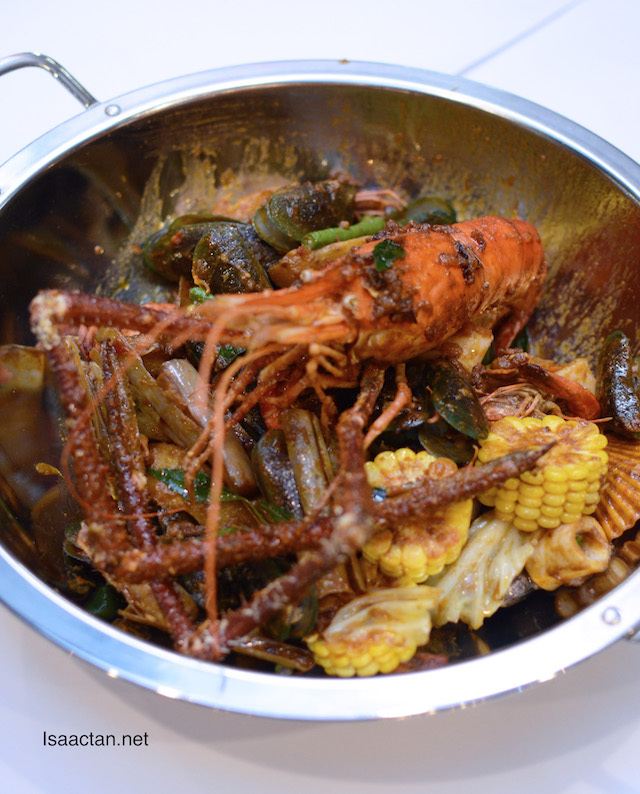 The new offerings were served at the newly renovated and refurbished interior of 33 Steamboat Restaurant. 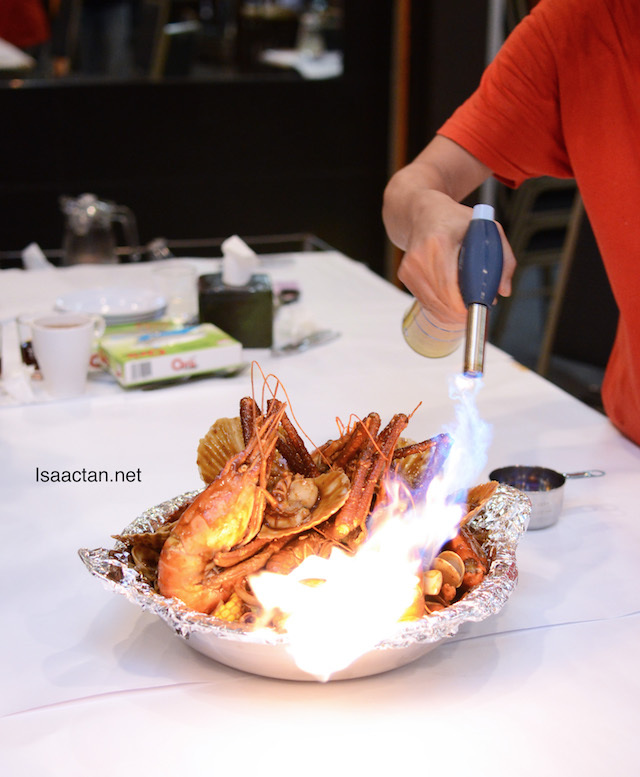 The owner Mr Simon did not hold back when splurging on the best for his restaurant, offering his loyal and new customers some really delicious seafood bringing the sea to the the dining table, fresh and yummy. 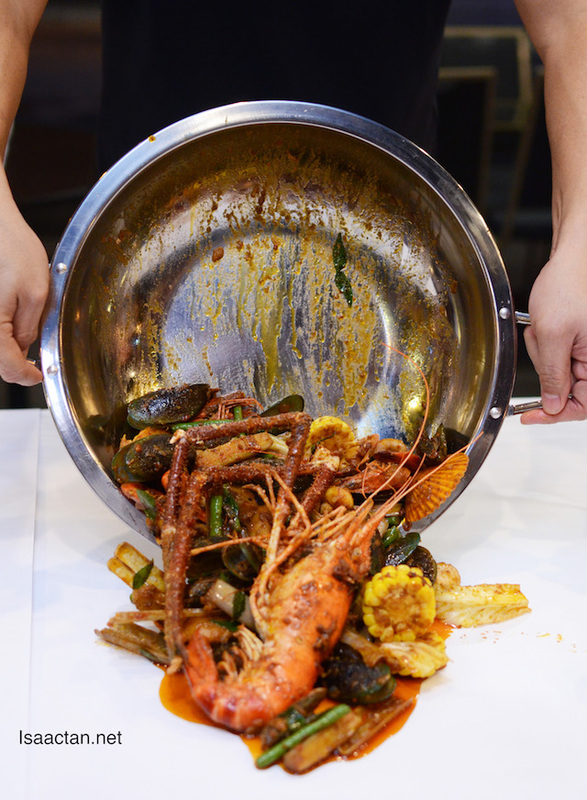 33 Seafood Steamboat Restaurant's new promotion menu includes four set menus (A, B and C) which varies in sizes. The prices start from RM 98 (Set A) serving 2-3 pax, RM 168 (Set B) serving 3-4 pax, RM 288 (Set C) for 5-6 pax to Jumbo Set - RM 368 (Set D) for 7-8 pax. 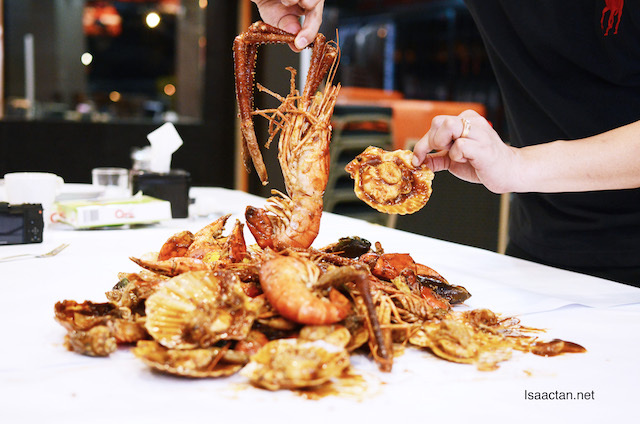 Each of the sets includes a mix of Fresh Live Crabs, Sang Har (large-sized fresh water prawns), Tiger Prawn, Yabbie (crayfish), Bamboo Clam, Baby Octopus, Mussels, Golden Scallops, Sting Ray, Siakap Slice, Kappa, Flower Snail, and Abalone Slice. How's that for a beautiful array of seafood noms. We get to choose from five different types of sauces and cooking style, from the delicious Kam Heong style shown above, to the Sweet, Sour & Spicy style, to Flaming Pronto, Cheese Mozzarella and Thai Hot Sauce. My personal favourite would be the Kam Heong cooking style which should fit most customers' tastebuds. The curry leaves, curry powder and dried shrimps in the sauce does wonders to its aroma and flavours. I haven't started on the really fresh seafood. Set B is good for sharing between 3 to 4 pax, a sweet spot for me. 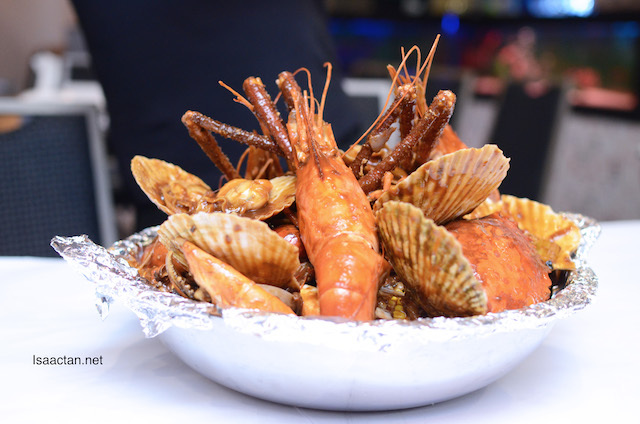 Inside the set you should be able to find a Fresh Live Crab or 2 pieces of Fresh Water Prawn, Tiger Prawn, Bamboo clam, Baby Octopus, Yabbie, Mussels and Golden Scallop. I was especially intrigued with the cheesy mozzarella set, as the cheese was really thick and gooey, where we could literally pull it while its still hot. Really good stuff here. A flaming good dish! The Jumbo Set D, Flaming Pronto came next, good to be shared from 7-8 pax. A huge offering, made better with its special flavour enhanced with whisky. I was told the sauce is home made, perfected from trials and errors. A quick flame, and we're good to go! What's inside this huge pile of goodness? 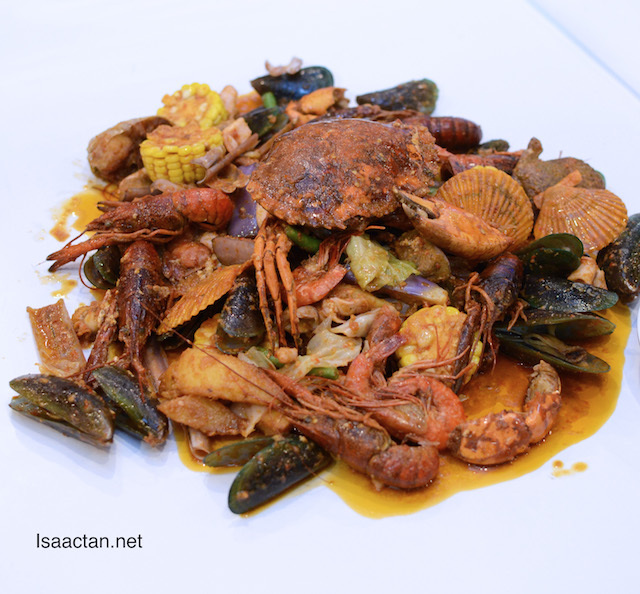 For starters it consists of Fresh Live Crab, Fresh Water Prawn, Tiger Prawn, Bamboo clam, Baby Octopus, Stingray, Yabbie, Siakap slice, Kappa, Mussels, White Scallop, and Abalone slice. How's that for a mouthful. Set A which is good to be shared from 2-3 pax. A real spicy offering, with cili padi (bird's eye chilli) grinded into the sauce, not for those who are afraid of spicy food. An essentially Chinese flavoured set, we had the Sweet, Sour & Spicy style sauce in Set A (2-3 pax) next. Love the flavours though, as it was a mix of hot, sweet and tangy sensation all in one. 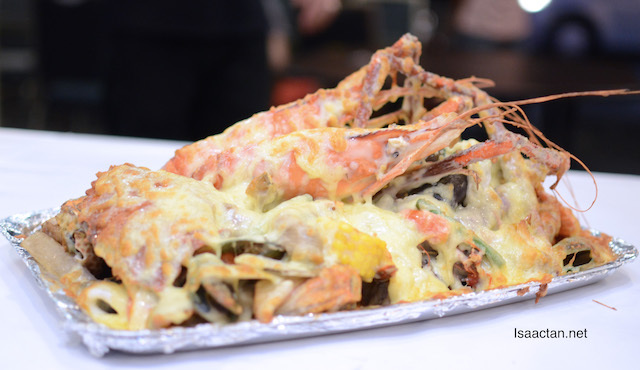 Feel your lips and tongue burn after biting into those juicy seafood. What? All that for only RM98? Value for money! We had the Thai Hot Sauce Set A (2 to 3 pax) next, which is good for sharing, or if you are a big eater you can have all that goodness to yourself. Cooked Thai styled, the sauce did not really hit it with my tastebuds. 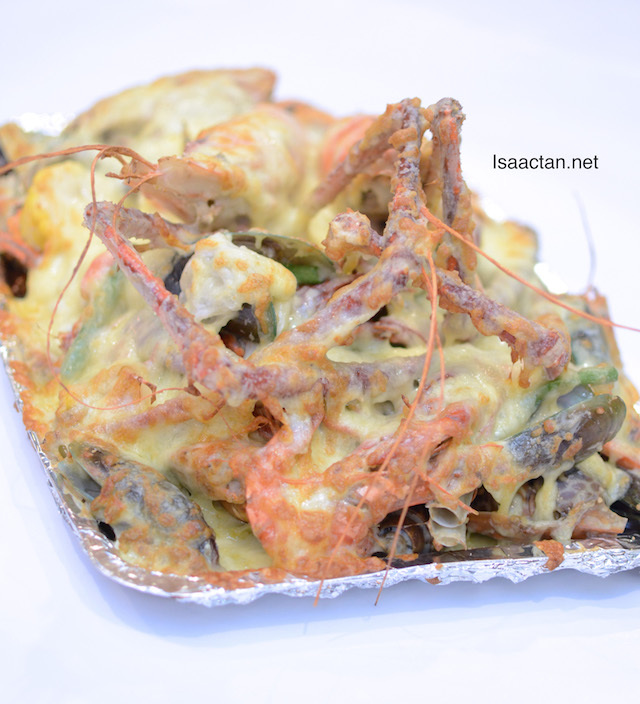 However the seafood contained inside made up for it. 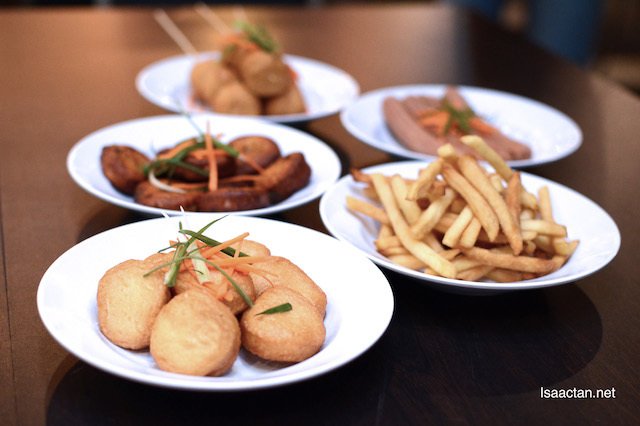 Various fried snacks and side dishes were available to be ordered as well. There were Chicken Wings, Deep Fried Fish Balls, Muar Otak-Otak, Thai Fish Cake, Chicken Nuggets, and Seafood Tofu just to name a few. Not bad at all, but I somehow feel I would have been stuffed from all the seafood to be able to order more side dishes at the end. Being a family man himself, the owner Mr Simon made sure to include two yummy Kiddy Set Meal in his menu. 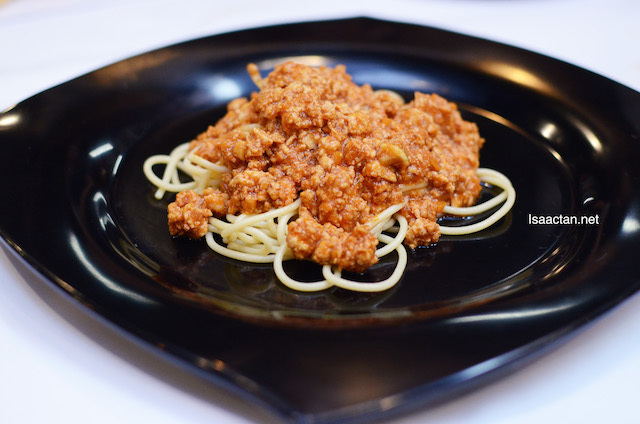 Kids get to choose between Spaghetti with Chicken Bolognaise or Spaghetti with Seafood Mornay Sauce, each with a scoop of ice cream included. Yay for being a kid! 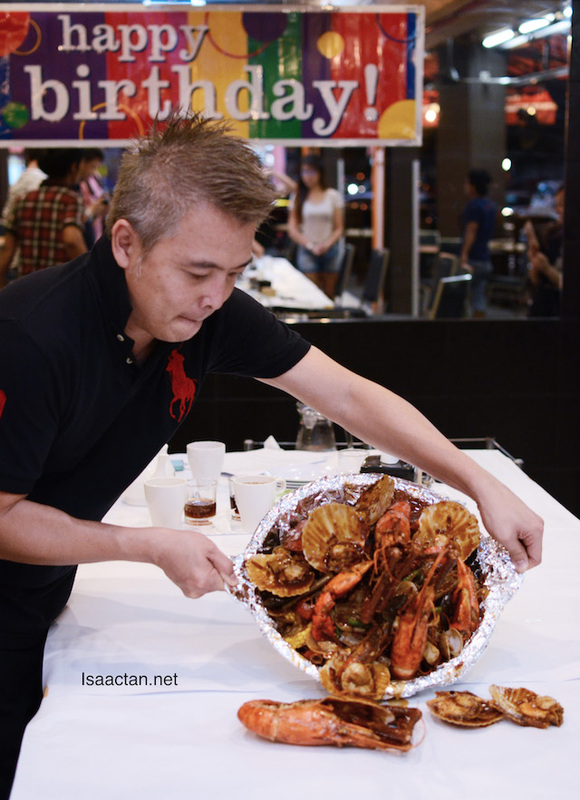 We ended our delectable seafood feast at 33 Seafood Steamboat Restaurant @ Bandar Puteri Puchong with their huge Giant ABC. It's huge I tell you, good enough to be shared by 3 to 4 pax. 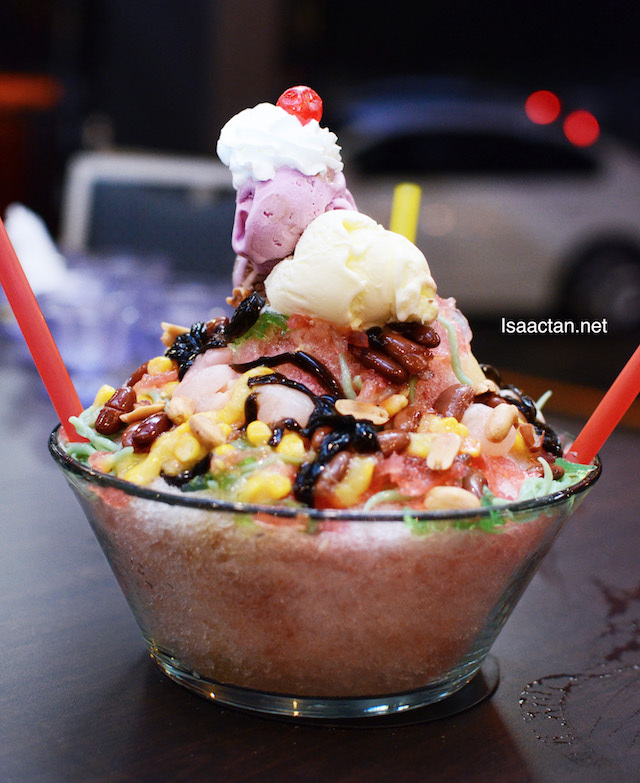 The Giant ABC contained generous amounts of sweet ABC ingredients from the nuts I love, to the corn, cendol, scoops of ice cream and many more. 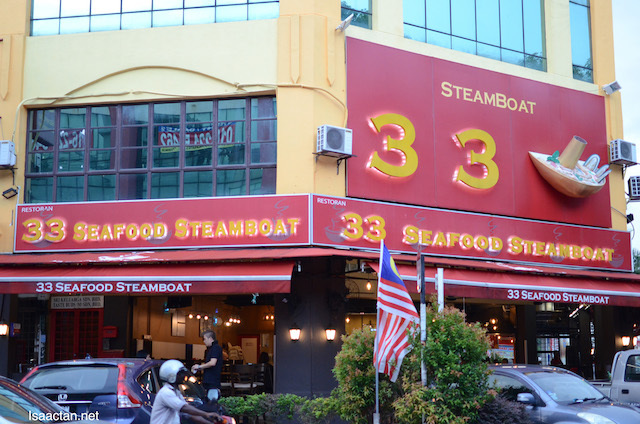 The next time you're in the mood for some rather modestly priced seafood feasting, be sure to drop by 33 Seafood Steamboat. See you there! Woo that Thai Hot Sauce looks delicious! So much of seafood there, must hang out with my besties one day there! The first photo on the post is already killing! Another finger lickin' good to taste out! Everything looks so delicious and mouthwatering! We're definitely spoilt for choice! The seafood is really calling out to me. But I am wondering if I will ever have the opportunity to go to Puchong. The prawns really big and looks fresh too. Will ask my hubby to bring me there to fulfill our seafood cravings. Heavenly meal it must be for Seafood lovers! Looks very authentic. Oh my! Glorious is the word...and the owner is quite good looking too, eh? 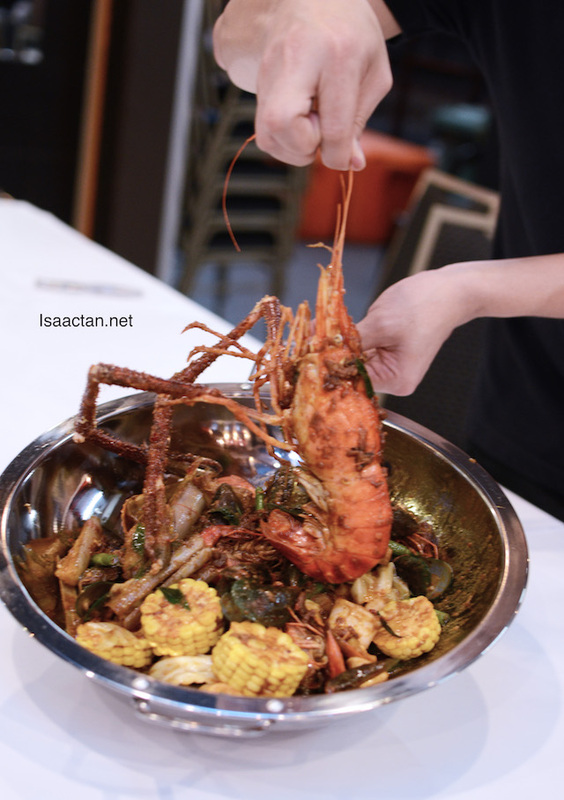 Oh my the seafood here looks so good Isaac, plus the pricing is actually not too bad come to think of it ;) Very very tempting. Never tried this before. even the concept is not new in market. should take some time to try out good food! I want to try the flaming pronto !! I need some seafood feast !